FEATURE – It’s been nearly a year since Groovefest Music and Art Festival co-founder Tim Cretsinger was diagnosed with HPV throat cancer, and the memory of that moment is as fresh in his mind as the moment it happened. Cretsinger said he had started to notice a lump in the back of his throat sometime in Oct. 2013. Using the internet to self-diagnose, he said he was convinced that the lump was nothing more than an unusual abscess called a quinsy that needed to be lanced and drained. “I diagnosed myself and that was stupid,” he said. He said he hadn’t really been in a doctor’s office in 25 years, but by December the irritation had become so painful he decided it was time to go in. Sitting on the edge of the table, bracing himself for the pain of a scalpel, Cretsinger said he opened his mouth wide to show the ear, nose and throat specialist where to cut. One quick look at the lump in the back of his throat was all the doctor needed to deliver the unexpected blow, Cretsinger said. The irritating lump was no quinsy abscess, he said – it was a hard tumor – cancer, caused by the human papillomavirus. Shocked and disoriented, Cretsinger said, he and his wife had a difficult time digesting the news at first. As it slowly sunk in, he said the realization struck him that somehow, he would never be the same. 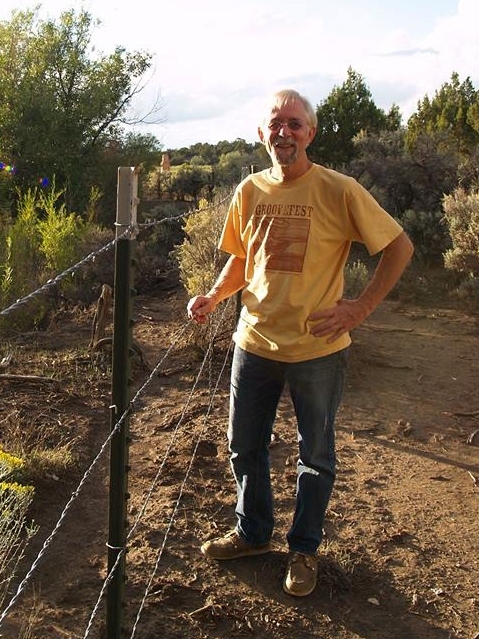 The only comfort he found throughout the duration of his treatments came from incredible support he received from his wife and friends, Cretsinger said, the friendliness of the dedicated staff at the Huntsman-Intermountain Cancer Center, and the technology available in the tiny town of Cedar City. 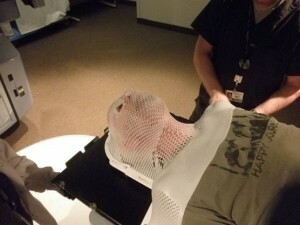 Tim Cretsinger being prepared for radiation therapy by radiation technician Mat Cole. Photo provided by Tim and Lisa Cretsinger, taken by Lisa Cretsinger. Cretsinger said that he and his wife were looking into switching health care coverage just as his diagnosis came in which could have meant a death sentence, but thanks to the timing of the Affordable Care Act, insurance companies were not allowed to turn him away based on a preexisting condition. 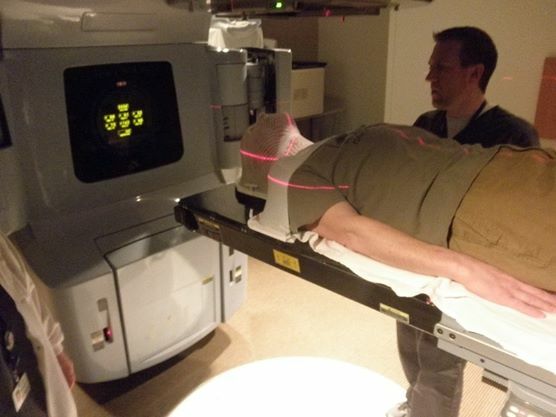 It was a bit surreal, he said, the first time he walked into the cold, sterile room where he would receive radiation over two months time, and the strangeness of it all left him feeling a little unsettled. 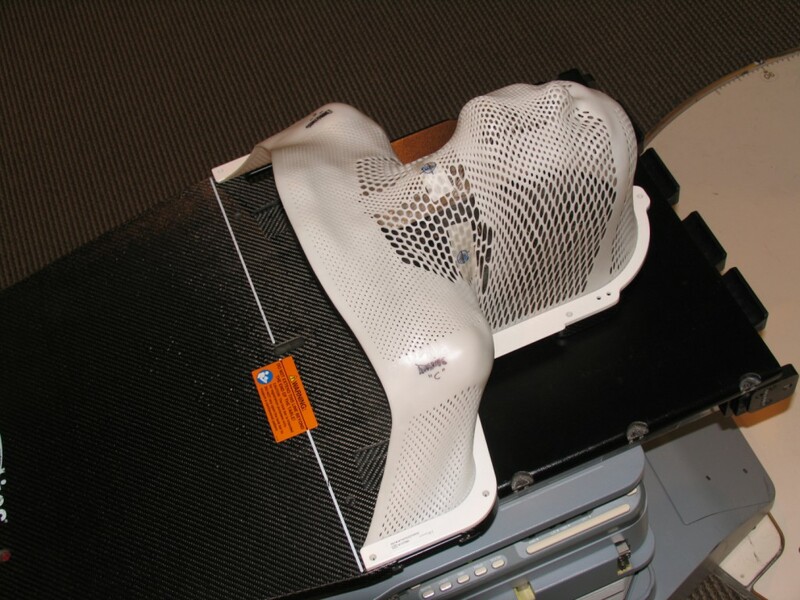 Cretsinger said he was fitted for a plastic, mesh mask that would keep him still so the radiation could focus on the exact same place every time – another strange accoutrement to add to the laundry-list of weirdness. The enormity of the room that housed the radiation machine that would zap Cretsinger’s lymph nodes and hopefully kill the cancer did little to curb the claustrophobic panic and occasional loneliness that crept in during treatments. He came to terms with it quickly however, because, “well, what’s the alternative?” he said. Eventually, the 20 minutes he was strapped to the table, unable to move, became a time of meditation for him. Sometimes, he said, it felt like he was on a spaceship in a sci-fi flick preparing to shuttle off to worlds unknown. Though he jokes about it now, Cretsinger said there was nothing funny about going through cancer treatment. He said there were times when he had reached incredibly low points, and though he never tried himself, he could understand why some people contemplated or attempted suicide in the face of cancer treatment. “I just can’t imagine what’s it’s like for those people who have to go through this alone,” he said, drawing a deep sigh and staring off into the distance. Tim Cretsinger, Sept. 21 at Old Iron Town, Utah. Photo provided by Tim and Lisa Cretsinger. Cretsinger said his treatments ended on March 31. Since then, his strength has returned considerably – along with a bit of his facial hair – and he was able to do more with each passing day. Even though his treatments ended more than seven months ago, Cretsinger still feels weaker than normal for himself, he said, and he has yet to regain the ability to produce saliva or taste food – though he said he hoped that isn’t too far behind. Of everything he went through, the chemotherapy was the worst part. He was supposed to have three doses, and was grateful when his doctor called off the third, Cretsinger said. In a week-and-a-half, Cretsinger will go and have a PET scan to evaluate his cancer-free status, but so far everything has been looking good, he said. In the year since his diagnosis, Cretsinger has become a staunch advocate for HPV throat cancer awareness. However, just raising awareness isn’t enough, he said, it must be paired with a call to action. He believes that with education should come a call to action. Inoculating adolescents against the HPV virus can save lives he said, and it has become a new life mission to help spread the word. I went through the same treatment for the same thing. They tried something “new” with me because I was in total shape. They decided to do 7 weeks of radiation (on my tongue) in 6 weeks. 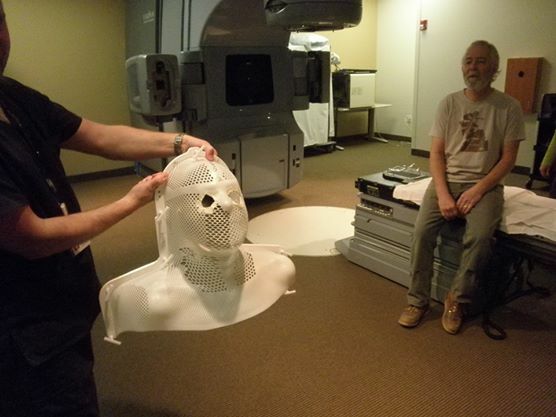 Instead of one radiation treatment five days a week, they decided to do 4 days of radiation and then three treatments within 24 hours at the end of the week. I was the first and LAST person they did that too. The discovered it was way too much. My entire neck burst open everywhere except at the very back. I was one huge bleeding open sore of 2nd degree burns completely through my neck for inside to outside. The chemo they gave me was likely the same as yours (cisplatin in the highest dose they give). I also spent the night in the hospital for the FIRST one of those which turned out to be the last one I had because I had a horrible reaction. They’d never seen it before. It turned out to be completely neurotoxic to my central nervous system. I literally almost died. They called Stanford University Hospital and were told I had “a rare reaction that happens in 0.12% of people.” They told them they could not do it to me again or it would definitely kill me. I had a surgery for 6 1/2 hours on my neck prior to all the radiation and chemo. Unfortunately that destroyed my 11th cranial nerve (Accessory nerve) and I no longer can use my right shoulder as those muscles get no nerve innervation (trapezius, sternocleidomastioid and supraspinatous are totally dead). The treatment was beyond brutal. I am SO grateful they won’t radiate people like they did me. It is simply TOO much to have three of those within 24 hours. The pain was so bad liquid morphine did nothing. They told me it wouldn’t. Sounds like you went through hell. Sorry to read about the nerve damage you experienced. Tim underwent a tonsillectomy that took 5 weeks to recover from. He was in a lot of pain for a very long time. He was also given cicplatin that made him ill and caused severe ringing in his ears. Fortunately for a 63-year-old, my teeth were in excellent condition and didn’t need to be extracted. My chemo was cisplatin and did result in some tinnitus, but no hearing loss. Lest there be any doubt, the Canadian health system worked wonderfully for me and continues to do so. I was fine for the first half of the procedure and lost only about ten pounds. Unfortunately, I then lost an additional 30 pounds in the last month of the process, ending up going from just over 190 pounds at the start of the process to about 150 pounds at the end. Even though I had an appetite and had no trouble swallowing, I couldn’t keep anything down, at least not for long. I made it through on sheer determination, adhering to the bad Latin admonition – “Illegitimi non carborundum”. Within 24 hours of the end of my radiation treatments, I checked into my local hospital and stayed there for ten days because of pneumonia and concerns that my kidneys might be approaching a danger zone – it was the best place for me to be as I spent those ten days on IV, nibbling bland food (and keeping it down) and getting out of bed only to use the washroom about every hour. I didn’t realize and/or ignored that chemo and radiation keep working for three months after the treatments end, and that extended my recovery process accordingly. I’m now (January 2015) back up to just over 180 pounds, my saliva activity is about 25% of what it was before, but at least that’s better than nothing. I never did have any trouble swallowing. I haven’t taken a pill for anything since May. My voice is an octave lower, leading me to fantasize that I should retire from farming and pursue a late-career position as an on-air personality at a heavy-metal radio station. If there’s a good point, it’s that I’ve never heard the word “remission”, and have only heard the word “cure” which is a blessing as a good friend of mine has just been diagnosed with a lymphoma for which there is not a cure, only a remission. I’ve since become a cancer-warrior for the need for mandatory publicly-funded (we do these things in Canada) gardasil vaccinations for all 12-year-olds. Two of our ten Provinces aready do so, but alas, not mine (Ontario). I’ve also used my experience, and that of my caregiver, to produce a “Damn, I wish somebody had told me that” list for people about to undergo not just treatment for HPV-related throat cancer, but all types of cancers. Well, since the radiation and chemo didn’t work and Tim required a radical neck dissection a few months later… What is the point of this article/story?